Schizophrenia, a mental disorder characterized by a breakdown of thought processes and by poor emotional responsiveness (Concise Medical Dictionary, 2010), affects approximately 0.7% of the world’s population (MacDonald & Schulz, 2009). The disorder typically begins during young adulthood, with the average time of onset being late adolescence for males and young adulthood for females (MacDonald & Schulz, 2009). Onset is quite rare before puberty or after middle age begins (MacDonald & Schulz, 2009). While the cause is still unidentified, heritability is known to be a strong factor, with a correlation coefficient of about 0.81 (MacDonald & Schulz, 2009). However, a lower, 50-percent concordance between identical twins suggests that environmental or stochastic influences also play a role (MacDonald & Schulz, 2009). As far as prognosis, the longer a patient’s psychosis goes untreated, the poorer his or her response to treatment. With a relatively high incidence worldwide, no identified cause, and extremely debilitating symptoms, schizophrenia has been the object of many studies over the years. These studies have yielded very specific guidelines for the diagnosis and treatment of schizophrenia, and these guidelines are meant to be applicable to people all around the world. The DSM-IV classifies anyone having at least two positive symptoms (delusions, hallucinations, disorganized speech, grossly disorganized or catatonic behavior) and/or negative symptoms (flat affect, anhedonia (inability to experience pleasure), abolition (lack of drive), or alogia (poverty of speech)) for a significant portion of one month, and general disturbance for at least six months, as clinically diagnosable with schizophrenia (APA, 2000). Furthermore, within the umbrella of schizophrenia, the DSM also identifies four subcategories—the paranoid, catatonic, disorganized, undifferentiated, and residual types—each with its own, unique combination of the presence and absence of particular symptoms (APA, 2000). Such clearly and strictly defined criteria for the disorder raise the question of whether the disease varies across cultures. Schizophrenia has been observed all around the world in various countries, cultures, and races and thus, there is no doubt that it is a universal illness. But does the disorder manifest itself in the same way in all of these countries, as the DSM diagnosis criteria would suggest? Recent research shows this to be false. Schizophrenia does indeed vary in many ways across the world. Firstly, different cultures and races display markedly different symptoms and manifestations of schizophrenia, often due to the cultural norms and sociocentricity of a culture (Bauer et al., 2011; Brekke & Barrio, 1997; Habel et al., 2000; Bae & Brekke, 2002). Secondly, during the diagnostic phase, psychiatrists’ racial biases or the connotations of the word “schizophrenia” in a culture’s language have been shown to influence clinical diagnoses (Barnes, 2004; Kim & Berrios, 2001). Thirdly, culture affects the way psychiatrists clinically treat schizophrenic patients. Patients of different cultures and races are prescribed various antipsychotic medications of varying degrees of effectiveness. They also receive their medications in a range of different settings (e.g. administered by friends and family at home as opposed to administered by doctors and nurses in a hospital setting) (Kreyenbuhl et al., 2003; Srinivasan & Thara, 2002). This paper will outline the aforementioned research, demonstrating marked differences in the diagnosis, symptoms, and treatment of schizophrenia in various ethnicities and cultures. A characterization of schizophrenia (and indeed, any psychopathology) is incomplete without a comprehensive understanding of its cross-cultural variance. Without learning about the effects of culture on the manifestations and treatments of different psychopathologies, the mental health community cannot hope to accurately diagnose and adequately treat patients from varying backgrounds. Despite the fact that the DSM-IV guidelines were intended to be universal, the following studies show that these guidelines have fallen short and that considerations of cultural variance need to play a greater role in the diagnosis and treatment of schizophrenia. Variation in the symptoms of a psychopathology is perhaps the most expected form of cultural variance, and it is indeed quite apparent in schizophrenia. Substantive research shows that basic schizophrenia symptoms such as hallucinations, anhedonia, antisocial behavior, depressive symptoms, emotional processing, and mood induction, vary across cultures (Bauer et al., 2011; Brekke & Barrio, 1997; Habel et al., 2000; Bae & Brekke, 2002). The concepts of sociocentricity, individualism, and collectivism are critical to understanding the cultural variance in schizophrenia. Sociocentricity refers to the scale ranging from strong individualism to strong collectivism, on which a culture may be measured. Collectivism in a culture involves the following group of concepts and values: concern about the effects of actions or decisions on others, sharing material and nonmaterial goods, willingness to accept the opinions and views of others, giving importance to self-presentation and social acceptability, believing that one’s own outcomes correspond to the outcomes of others, and feeling involved and connected to the lives of others (Hui & Triantis, 1986). In collectivistic cultures, individual desires and achievements are downplayed, while contributing and belonging to a family and society are emphasized. Consequently, individualism is the lack of these values. In individualistic cultures, emphasis is placed on the individual, his or her own needs and wants, and his or her own benefits and successes. In such cultures, individuals are expected and encouraged to follow their own desires and strive for their own benefits, rather than those of their family or society. A team of researchers hailing from seven different countries showed that hallucinations—a key symptom in the diagnosis of schizophrenia—vary greatly both in incidence and in type across cultures. They conducted a comparative study of the incidence of hallucinations in adult schizophrenic patients across various countries between the years 1996 and 2001 (Bauer et al., 2011). Of the 1080 total subjects of the study, 350 patients were from Austria, 80 from Poland, 73 from Lithuania, 74 from Georgia, 103 from Pakistan, 324 from Nigeria, and 76 from Ghana (Bauer et al., 2011). Experienced psychiatrists and psychologists underwent training for this particular study, conducted DSM-IV Structured Clinical Interviews with the patients, and rated them on the “Fragebogen zur Erfassung psychotischer Symptome” scale. This scale was developed specifically in 1994 for cultural comparison studies on psychotic symptoms of schizophrenia (Bauer et al., 2011). It measures three categories of symptoms: delusions, hallucinations, and Schneider first-rank symptoms (symptoms practically exclusive to schizophrenics, such as delusions of being controlled by an external force, the feeling that thoughts are being inserted into or withdrawn from one’s conscious mind, and hearing hallucinatory voices, among others) (Schneider, 1959). The Fragebogen zur Erfassung psychotischer Symptome scale was tested for interrater reliability for the study, and yielded a Cohen’s kappa coefficient of between 0.75 and 0.98 (Bauer et al., 2011), signifying strong interrater agreement. The types of hallucinations measured were auditory, visual, cenesthetic, tactile, olfactory, and gustatory (Bauer et al., 2011). They found that not only were there across-the-board differences in the rates of incidence of each of these types of hallucinations (with auditory hallucinations being the most common and gustatory hallucinations being the least common), but there were also pronounced differences in hallucination patterns among the countries (Bauer et al., 2011). West African countries Ghana and Nigeria had the highest rates of auditory hallucinations at 90.8% and 85.4%, respectively, while Austria had the lowest, at 66.9% (Bauer et al., 2011). While most countries had relatively high rates of visual hallucinations (e.g. Austria: 39.1%, Ghana: 53.9%), only 3.9% of Pakistani patients and 9.5% of Georgian patients experienced them (Bauer et al., 2011). Because other important factors were carefully controlled, the authors came to the conclusion that this variety of hallucination rates, particularly for visual hallucinations, must be a result of cultural differences, particularly in perceptual and attentional processing (Bauer et al., 2011). Westerners tend to pay more attention to salient objects in an image rather than the background and tend to have a perceptual (concrete) orientation in vision (Bauer et al., 2011). Meanwhile, East Asians pay more attention to the background and have a more conceptual (abstract) orientation in vision (Bauer et al., 2011). These different emphases in visual and attentional processing could be the source of the differentiation in hallucination types observed among different cultures. In 1997, researchers Brekke and Barrio conducted a study that differentiated the often-overlapping effects of minority status and low socioeconomic status in the United States. They noted that in the United States, minorities often comprise the lower social classes. Therefore, in most psychological studies involving minority patients, one variable confounds the other. Hence, Brekke and Barrio designed a tri-ethnic study that would measure schizophrenia symptoms and sociodemographic information of Caucasian Americans, Black Americans and Latinos, and then would analyze each factor while controlling for the other (Brekke & Barrio, 1997). They recruited 184 participants: 51.6% white, 32.6% African American and 15.8% Latino (Brekke & Barrio, 1997). Two collectivist cultural values—empathy and social competence (termed “sociocentric indicators” for this study)—were used to differentiate minority from nonminority groups. Data were gathered through biannual face-to-face interviews with the participants over a span of three years (Brekke & Barrio, 1997). Contrary to the expectations of some, the nonminority group was consistently more symptomatic than the minority groups (Brekke & Barrio, 1997). Significant differences in eight symptom variables (overall severity of symptoms, hostility, asocial behavior, disorganization, bizarre behavior, mannerisms, anhedonia, and tension) persisted even after controlling for social class (Brekke & Barrio, 1997). Furthermore, Brekke and Barrio (1997) found that social class “strongly mediated” the severity of these cross-ethnic symptom differences, as did the sociocentric indicators, empathy and social competence (Brekke & Barrio, 1997). Overall, their results provided strong evidence against the theory that minority groups are more symptomatic and that they are more so because of their low social class. Instead, minority groups showed fewer symptoms, and the differences seemed to be based entirely upon the sociocentricity of their culture (Brekke & Barrio, 1997). Based on their findings, Brekke and Barrio recommend that “culture…be more fully integrated into current biopsychosocial models of schizophrenia” (Brekke & Barrio, 1997). The sociocentricity of a patient’s culture also manifests itself in his or her symptoms, as a team of researchers found in their cross-national study. Habel and colleagues (2000) conducted a study that showed that the values of a society—collectivistic or individualistic—could affect emotion processing and mood induction in schizophrenics. The researchers recruited 186 participants from America, Germany and India, with half of each ethnic group being schizophrenic patients and the other half being healthy controls (Habel et al., 2000). All groups were administered two tests: the Facial Emotion Discrimination Test and the Facial Mood Induction Task (Habel et al., 2000). In the first task, participants were shown 40 images of Caucasian faces (10 happy, 10 sad, and 20 neutral) and asked to determine their emotion, emotional intensity and age. In the second task, participants were shown a series of happy or sad Caucasian faces, and asked to use these images to help themselves become happy or sad. On the first task, schizophrenia patients overall performed worse than the control groups, as hypothesized. Another main effect noted was that Indian participants—both controls and schizophrenics—performed worse than American or German participants on Facial Emotion Discrimination Test. One possible theory to explain this could be that Indians had a harder time distinguishing the emotions on faces of a different race (Caucasian) than if they had been shown faces of their own race (as for the Americans and Germans). However, there was also a significant difference in the Facial Mood Induction Task. Whereas German and American participants’ moods were generally correlated with the target mood, Indian patients had significantly less positive affect during both positive and negative mood induction and Indian controls had significantly more positive affect than other control groups, overall. In their discussion, the researchers suggest that this can be attributed to the collectivistic culture in India, which promotes intensification of positive emotional experiences and suppression of negative emotional experiences for the greater happiness of the group. The researchers hypothesize that the controls may have demonstrated this important Indian cultural value, whereas the schizophrenic patients showed a deficit in understanding and internalizing this cultural norm. Korean culture also promotes similar collectivistic values that affect symptoms of schizophrenia, according to a 2002 study. Bae and Brekke (2002) recruited 223 adults diagnosed with either schizophrenia or schizoaffective disorder from varying backgrounds (Korean American, African American, European American and Latino) to participate in their study. Four factors of psychosocial functioning—clinical status, functional status, subjective experience, and community risk—were evaluated by conducting face-to-face interviews. Predictably, Bae and Brekke (2002) found that Korean American patients embodied the desired qualities of collectivistic cultures. Their closer family ties were evidenced by their higher tendencies to live with their families and work in family businesses. They also displayed less social friction, higher affiliative qualities and higher social competence than the other groups of psychotic patients. All of these qualities are normally associated with the collectivist value system. A negative influence, however, was that they had the lowest average self-esteem level of all of the ethnic groups (Bae & Brekke, 2002). This can be attributed to the collectivistic values of self-effacement and denial of one’s own positive attributes for the greater good of all (Bae & Brekke, 2002). Cultural variance in a disease does not necessarily refer solely to symptoms expressed by patients or the course of the disease. Variance can also express itself in the clinical process, namely, during diagnosis. Psychiatrists too can be influenced by their own culture or by the culture or race of their patient. These influences can result in skewed or biased diagnoses of schizophrenia. This is perhaps the darker side of cultural variance, as not only does it affect the diagnosis, but it can also negatively effect the patient’s treatment (as will be discussed in the next section). There exists a long history in the United States of diagnosing African Americans with schizophrenia as opposed to milder (or at least less stigmatized) disorders (Barnes, 2004). In 2004, Barnes conducted a study in Indiana analyzing data from 2,404 patients who were diagnosed with schizophrenia or a mood disorder and had been hospitalized previously (Barnes, 2004). Of the 2,404 patients, 80.5% were Caucasian American, 19.5% were African American, and almost all of them had been involuntarily hospitalized (Barnes, 2004). The data used in the study were obtained from the Indiana Family and Social Services Administration, which keeps records of all clients admitted to any of six state-run psychiatric hospitals (Barnes, 2004). Barnes (2004) found that a significantly higher percentage of African Americans were diagnosed with schizophrenia when compared to the general population of individuals admitted to the state psychiatric clinics. Additionally, African Americans were almost five times more likely than Caucasian Americans to be diagnosed with schizophrenia rather than a less severe mood disorder (Barnes, 2004). This shows that despite the incorporation of some ethnic and cultural information in the DSM-IV (which occurred in 1994), race continues to be decisive variable, even at the very first stage of diagnosis (Barnes, 2004). Not only does race play a role in diagnosis, but cultural values and language do also. Kim and Berrios’ (2001) study showed how the very language of a society could present an obstacle to accurate diagnoses of schizophrenia. The study dealt with schizophrenia diagnoses in ideographic cultures (Kim & Berrios, 2001). Ideographs are “picture[s] or symbol[s] used in a system of writing to represent a thing or an idea but not a particular word or phrase for it” (Merriam-Webster Dictionary, 2012), and ideographic cultures are cultures that employ the ideographic Chinese writing system. Examples of such countries are China and Japan. In their unique study, Kim and Berrios investigated the etymology of the term “schizophrenia.” “Schizophrenia” means “splitting of mental faculties” in Greek. However, most individuals in the English-speaking world today are not familiar with this origin of the word. As a result, the term tends to simply connote the mental disorder and nothing more (Kim & Berrios, 2001). 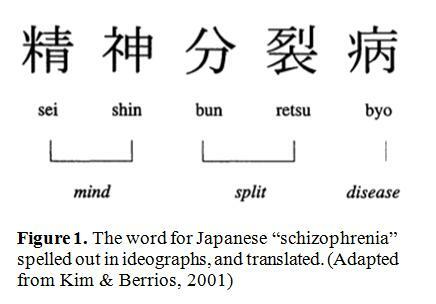 However, in ideographic countries such as Japan, the exact meaning of the word is very accessible, because the ideographs translate directly into three words: “mind,” “split,” and “disease,” or in other words, “split-mind disease” (Kim & Berrios, 2001). Needless to say, this is a very “powerful and stigmatizing” label in these cultures (Kim & Berrios, 2001), and this study found serious implications: that these connotations made psychiatrists less likely to reveal a diagnosis of schizophrenia to family members, and even patients themselves (Kim & Berrios, 2001). Kim and Berrios (2001) found that in Japan, only 16.6% patients knew their own diagnosis, and only 33.9% of their family members did (Kim & Berrios, 2001). In addition, psychiatrists often gave euphemistic diagnoses, such as “neurasthenia” or “autonomic nervous dysfunction” instead of the real diagnosis, making the prognosis and treatment even more complicated. Kim and Berrios (2001) regarded this phenomenon as so serious and ingrained that they suggested a renaming of the disease in ideographic cultures to promote transparency and easier communication. A final form of cultural variance in schizophrenia is present in the treatment of the disorder. Different types or doses of medications are prescribed to patients from different backgrounds, often reflecting psychiatrists’ preconceived notions and unconscious biases. Interestingly, the actual administration of the medication (e.g. by family at home or by a doctor in a hospital) also varies culturally, especially when dealing with noncompliant schizophrenic patients. Kreyenbuhl and colleagues (2003) conducted a study investigating the disparity between the pharmacological treatment of schizophrenia of Caucasian Americans and African Americans in the United States. The participants were 344 patients diagnosed with schizophrenia or schizoaffective disorder, recruited from psychiatric outpatient clinics in two states. Data were collected through cross-sectional patient surveys and medical record reviews. The results showed harsh disparities between the treatment of Caucasian American and African American schizophrenics. African Americans were three times more likely to be prescribed depot injection antipsychotic medications than were Caucasian Americans. Following this trend, a much smaller percentage of African Americans were prescribed new generation medications than Caucasian Americans. In fact, Caucasian Americans were a staggering six times more likely to be prescribed clozapine, a new generation antipsychotic drug, than were African Americans (Kreyenbuhl et al., 2003). A potential explanation that lacks prejudicial implications is the possibility that African Americans exhibit different symptoms compared to their Caucasian counterparts, and resulting in their differing prescriptions. Unfortunately, this was not the case. African Americans and Caucasians showed similar psychiatric symptoms and medication side effects overall. Kreyenbuhl and colleagues (2003) tested the data controlling for demographic and clinical covariates and still, the relationship persisted. This study suggests that even today, racism may play a role in the practice of psychiatry in the United States, having serious implications such as the neglectful treatment of African-American schizophrenic patients. Another study in India examined the effects of culture on involuntary administration of medication, a common phenomenon because schizophrenics often refuse to take their medications (Srinivasan & Thara, 2002). One close, cohabitant family member of each of the 254 schizophrenia patients was interviewed and asked about instances of noncompliance in the patient (Srinivasan & Thara, 2002). Well over half of the patients had refused to take oral medication in the past, with 58% of them being absolutely unable to be persuaded even after waiting, pleading, coercing, and threatening (Srinivasan & Thara, 2002). At this point, some patients were taken to a hospital where a medical professional administered the medication. In over 50% of cases, however, the family itself administered the medication to the patient without the patients’ knowledge (Srinivasan & Thara, 2002). This raises interesting implications regarding treatment of schizophrenics in different cultures. Collectivistic cultures such as in India place a great deal of emphasis on the family’s role in a patient’s care. Involuntary administration of medication by the family in India was morally sanctioned and even regarded as the family’s duty towards its ill member. By contrast, in individualistic, Western cultures, such involuntary administration of medication is atypical and could even be considered a violation of the patient’s rights. Culture irrevocably plays an integral role in the manifestation of symptoms, the diagnosis, and the treatment of schizophrenia. Often, cultural variance is conceived of as only symptomatic variance. However, as demonstrated in this paper, cultural beliefs also affect the diagnosis, treatment, and care given by psychiatric professionals and families. Since culture is the environment in which everyone’s value systems, moral judgments, and even perception of concrete facts and evidence are formed, it affects everyone in the medical care system—patients, psychiatrists, and families alike. These effects are certainly not limited to schizophrenia; there are bound to be cultural implications in the diagnosis and treatment of all psychopathologies. The cultural variability of schizophrenia presented in this paper is just a sampling of the larger scale challenge that the mental health community faces today. Such variability exists in every psychopathology because cultural norms imbibe themselves in the mentally ill, as they do in the healthy. For this reason, a cross-cultural perspective is not only important, but also crucial when treating schizophrenia or any other mental disorder. Psychologists and psychiatrists must be aware of cultural differences if they wish to adequately diagnose and treat patients who inevitably come from varying cultures and backgrounds. The universal goal of reaching an unbiased clinical process right away is an unrealistic one. Perhaps the clinical community should instead invest its energy into learning more about the effects of culture and how it can be controlled, mediated, and adjusted. This process could include conducting more comparative, wide-ranging cross-cultural research studies such as the ones presented in this paper. In these studies, it will be important to research cultures of all countries, not just the largest ones or the ones with the largest populations. It will also be necessary to study the treatment of patients of one culture living within another (i.e. minorities). As evidenced by the studies of African American schizophrenics in the United States (Barnes, 2004; Kreyenbuhl, et al., 2003), minorities are particularly vulnerable to being misunderstood or even being deliberately maltreated by mental health professionals. The next challenge will be to develop procedures that would slowly eliminate cultural biases in psychiatric clinics. This could be achieved through culture consciousness trainings for mental healthcare professionals or periodic audits of psychiatrists’ exams and prescriptions by an authorized auditing board. While there exist many organizations that have worked on and succeeded in improving mental healthcare standards, few have focused specifically on culture-consciousness. The Global Initiative on Psychiatry (GIP), for example, dedicates itself to creating the “necessary reforms” to bring about “humane, ethical, and effective mental health care throughout the world,” but does not directly mention cultural awareness in its mission statement (GIP Mission Statement). On the other hand, several cultural competency measurement tools have been developed, mainly in the United States, which have achieved some success. For example, the Inventory for Assessing the Process of Cultural Competence Among Healthcare Professionals-Revised (IAPCC-R), a measure which assesses five constructs—cultural desire, cultural awareness, cultural knowledge, cultural skill, and cultural encounters—has been translated into several languages and used internationally (Campinha-Bacote, 2011). The U.S. Department of Health and Human Services-funded Cultural Competency Assessment Tool for Hospitals (CCATH) has also been subjected to extensive qualitative testing (Campinha-Bacote, 2011). These kinds of instruments should be further developed, consolidated, and then implemented on very large scales. With regards to national mental healthcare boards, Australia has been one of the trailblazers in setting national mental health service standards that directly address issues of culture. Australia’s 2010 handbook named “National Standards for Mental Health Services” demands mental healthcare “that take[s] into account the cultural and social diversity of its consumers and meet[s] their needs and those of their care[give]rs and community throughout all phases of care” (Australian Government, 2010). It also directly addresses the minorities of Australia, requiring special attention to be paid to the needs of the Aboriginal and Torres Strait Islanders (Australian Government, 2010). This is an example that could serve as a model on a larger, global scale. Many countries have similar national mental health boards, but it is necessary to have a strong community at the global scale as well. International dialogue between mental health professionals would not only automatically improve cultural awareness among them, but it could also set global standards and guidelines for mental healthcare services. Most importantly, any robust findings of cross-cultural studies and agreements from international dialogues should be incorporated into the next edition of the DSM and into the biopsychosocial models of psychopathologies, so that knowledge of cross-cultural variability and its implications may be taught to the next generation of mental health professionals. The studies presented in this paper yield findings that urgently require the attention of medical health professionals, especially those who treat schizophrenic patients. While schizophrenia is known to be a mental disorder found in all countries, the DSM-IV guidelines (which are intended to be universal) clearly fall short on cultural considerations. Schizophrenia is manifested differently in different cultures, often according to the sociocentricity of the culture. Furthermore, psychiatrists, often differ in their diagnoses and treatment of schizophrenic patients due to their own culture and the perception of their patients’ race and culture. In this regard, current mental health boards and auditing services fall short. The studies in this paper specifically deal with schizophrenia, but if such cultural variability exists in one psychopathology, it surely exists in many more, if not all. More cross-cultural, comprehensive studies need to be done to investigate the full effects of cross-cultural variability on symptoms, diagnosis, and treatment of different psychopathologies. These findings should soon be incorporated into the following DSM and taught in university psychiatry programs. Furthermore, cross-national and global mental healthcare and auditing boards should be established to strengthen cultural awareness and intercultural dialogue among mental healthcare professionals. With increasing understanding and awareness of culture and how it affects psychopathologies, we can perhaps one day reach the elusive goal of an entirely culture-conscious and bias-free clinical community. American Psychiatric Association. (2000). Diagnostic and statistical manual of mental disorders (4th ed., text rev.). Bae, S., & Brekke, J. S. (2002). Characteristics of Korean-Americans With Schizophrenia: A Cross-Ethnic Comparison With African Americans, Latinos, and Euro-Americans. Schizophrenia Bulletin, 28(4), 703-717. Barnes, A. (2004). Race, Schizophrenia, and Admission to State Psychiatric Hospitals. Administration and Policy in Mental Health, 31(3), 241-252. Bauer, S. M., Schanda, H., Karakula, H., Olajossy-Hilkesberger, L., Rudaleviciene, P., Okribelashvili, N., Chaudhry, H. R., Idemudia, S. E., Gscheider, S., Ritter, & Stompe, T. (2011). Culture and the prevalence of hallucinations in schizophrenia. Comprehensive Psychiatry, 52, 319–325. Brekke, J. S., & Barrio, C. (1997). Cross-Ethnic Symptom Differences in Schizophrenia: The Influence of Culture and Minority Status. Schizophrenia Bulletin, 23(2), 305-316. Habel, U., Guru, R. C., Mandal, M. K., Salloum, J. B., Gur, R. E., Schneider, F. (2000). Emotional processing in schizophrenia across cultures: standardized measures of discrimination and experience. Schizophrenia Research, 42, 57–66. Hui, C. H., & Triandis, H. C. (1986). Individualism-Collectivism: A Study of Cross-Cultural Researchers. Journal of Cross-Cultural Psychology, 17(2), 225-248. Kim, Y., & Berrios, G. E. (2001). Impact of the Term Schizophrenia on the Culture of Ideograph: The Japanese Experience. Schizophrenia Bulletin: 27(2), 181-185. Kreyenbuhl, J., Zito, J. M., Buchanan, R. W., Soeken, K. L., & Lehman, A. F. (2003). Racial Disparity in the Pharmacological Management of Schizophrenia. Schizophrenia Bulletin, 29(2), 183-193. National Mental Health Strategy. (2010). National Standards for Mental Health Services. Commonwealth of Australia: Australian Government. MacDonald, A. W. & Schulz, S.C. (2009). What We Know: Findings That Every Theory of Schizophrenia Should Explain. Schizophrenia Bulletin, 35(3), 493–508. Schizophrenia. (2010). In E. A. Martin (Ed. ), Concise Medical Dictionary (8th edition). Oxford University Press. Maastricht University Library. Retrieved June 29, 2010. Srinivasan, T. N., & Thara, R. (2002). At Issue: Management of Medication Noncompliance in Schizophrenia by Families in India. Schizophrenia Bulletin, 28(3), 531-535.